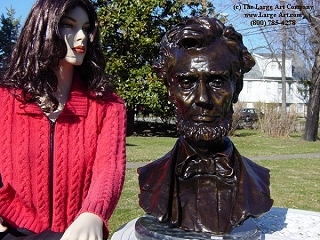 We are honored to present this handsome bronze bust of our nations 16th president Abraham Lincoln. The original of this bust was created by George Bissell in the late 1800's. Bissell is well known for his post civil war sculptures. This bust was molded after his world famous full-size sculpture "Emancipation" in Edinburgh, Scotland. This piece measures 19" tall by 12" wide and weighs 40 pounds.